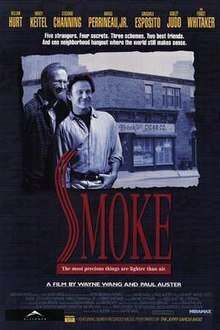 Smoke is a 1995 American independent film by Wayne Wang and Paul Auster. The original story was written by Paul Auster, who also wrote the screenplay. The film was produced by Greg Johnson, Peter Newman, Kenzo Horikoshi, and Hisami Kuroiwa. Among others, it features Harvey Keitel, William Hurt, Stockard Channing, Harold Perrineau Jr., and Forest Whitaker. The film follows the lives of multiple characters, all of whom are connected via their patronage of a small Brooklyn tobacconist store managed by Auggie (Harvey Keitel). Brooklyn Cigar Co. was located on the corner of 16th Street and Prospect Park West. On Rotten Tomatoes the film has a rating of 93% based on 29 reviews. It earned $8 million in the United States and $30 million internationally. The film was followed by Blue in the Face, a sequel of sorts that continues following a few of the characters and introduces several new ones. The character Augustus "Auggie" Wren (played by Harvey Keitel) is modelled after the real-life owner of Augie's Jazz Bar, which closed in 1998. When the establishment reopened in 1999, the new owners could not keep the former establishment's name. To honor its legacy, they named the new club after the 1995 film. ^ "Smoke". Rotten Tomatoes. Fandango Media. ^ Liu, Sandra (2000). "Negotiating the Meaning of Access: Wayne Wang's Contingent Film Practice". Countervisions: Asian-American Film Criticism. Temple University Press. p. 96. ISBN 1-56639-775-8. For paperback: ISBN 1-56639-776-6. ^ "Berlinale: 1995 Prize Winners". berlinale.de. Retrieved 2011-12-31. ^ "All That Jazz: Smoke Jazz and Supper Club, Harlem". Voyage.tv. Archived from the original on January 7, 2011. Retrieved June 30, 2011. ^ "Smoke Jazz & Supper Club-Lounge: Great Venue In New York". allyourjazz.com. January 13, 2009. Archived from the original on July 13, 2011. Retrieved June 30, 2011. ^ "NY Times Critic's Pick: Smoke Jazz & Supper Club-Lounge". NYTimes.com. Retrieved June 30, 2011. This page was last edited on 3 March 2019, at 11:14 (UTC).